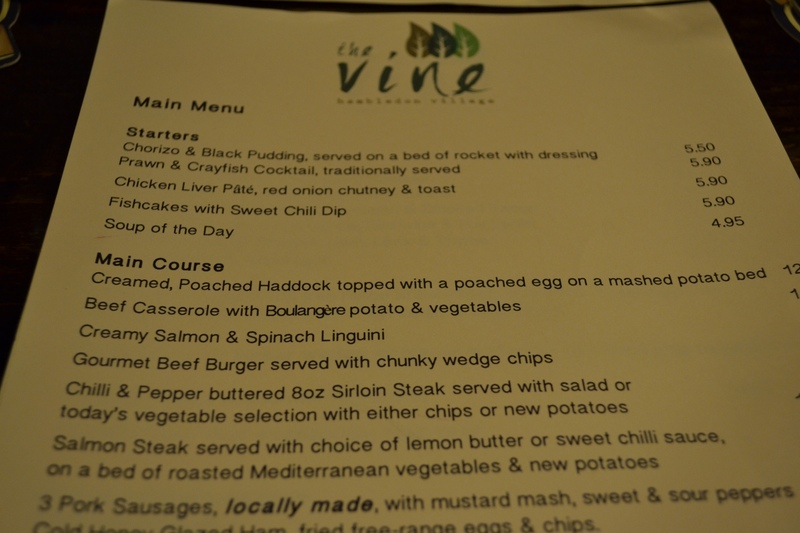 The Vine is a 17th century inn in Hambledon, Hampshire and is another country pub which has been on my list for a while, mainly because I pass it quite a bit whilst out cycling. I was meeting up with my two Italian friends again, Catia and Loretta (although I see Catia quite regularly, we eat at hers and watch ‘Cold Feet’ episodes whilst eating my favourite, smashed avocado’s on rye bread and topped with grilled halloumi – yum! 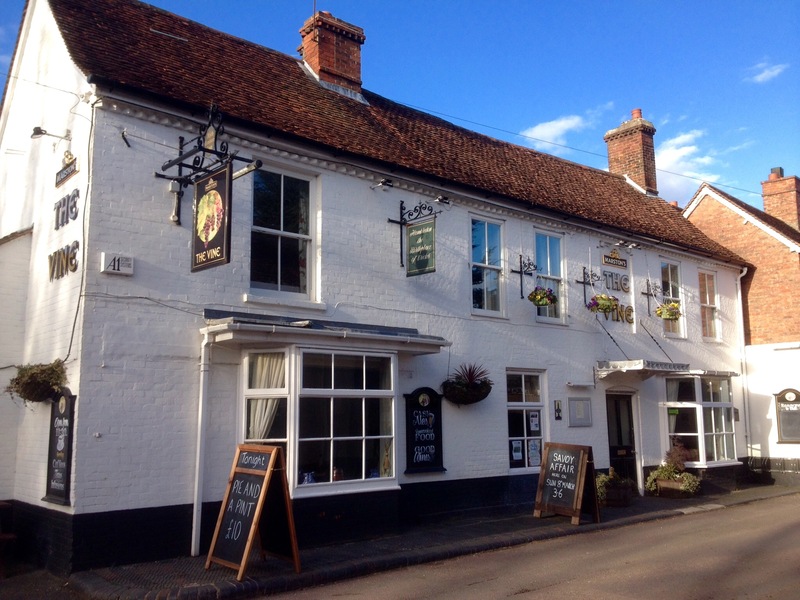 ), so it was a good excuse to visit and they both would rather go to a country pub than a pizza or pasta place. 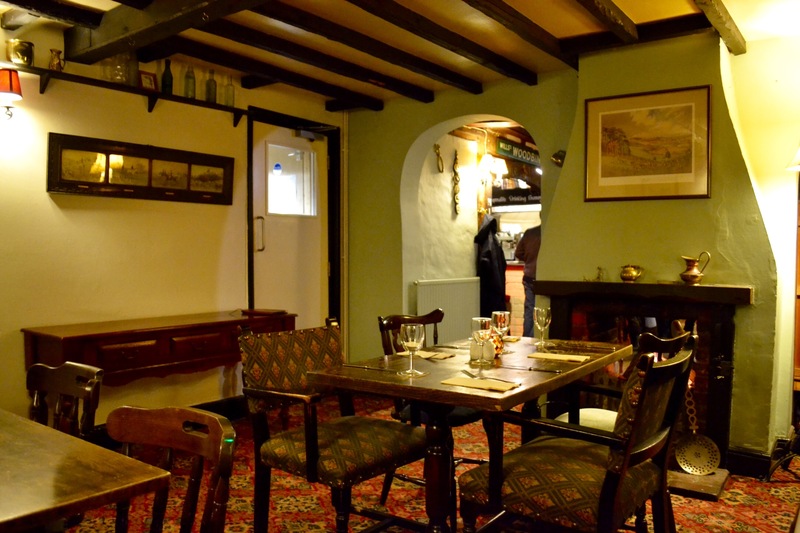 We were sat at a table in a little room with an open fire which went through to the other room. Myself and Loretta were sat on the old fashioned settle but Loretta found it uncomfortable as it was slightly higher than a chair and although I kind of agreed with her, I would have put up with it. 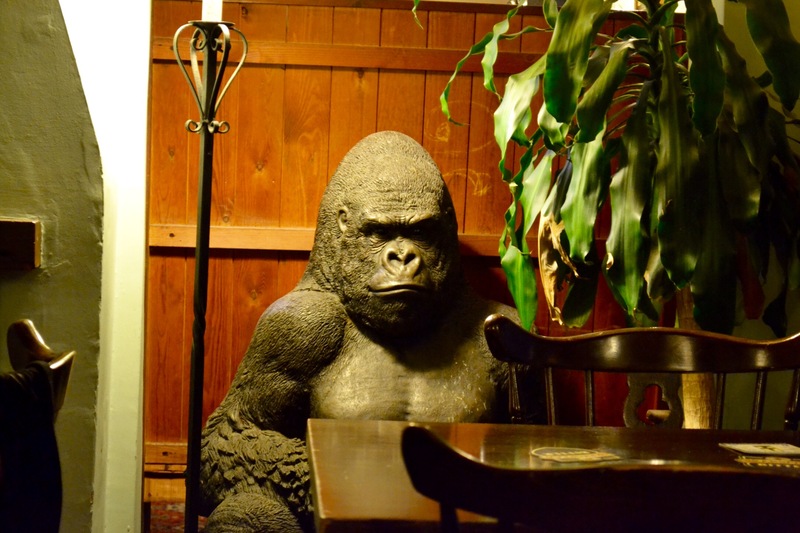 The landlord – a very pleasant and friendly chap – suggested another table in a different room, but we stayed where we were because of the fire and Loretta pushed the padded seat up behind us so we were sat on the bare wood. This was much better as it then made it the right height for the table. 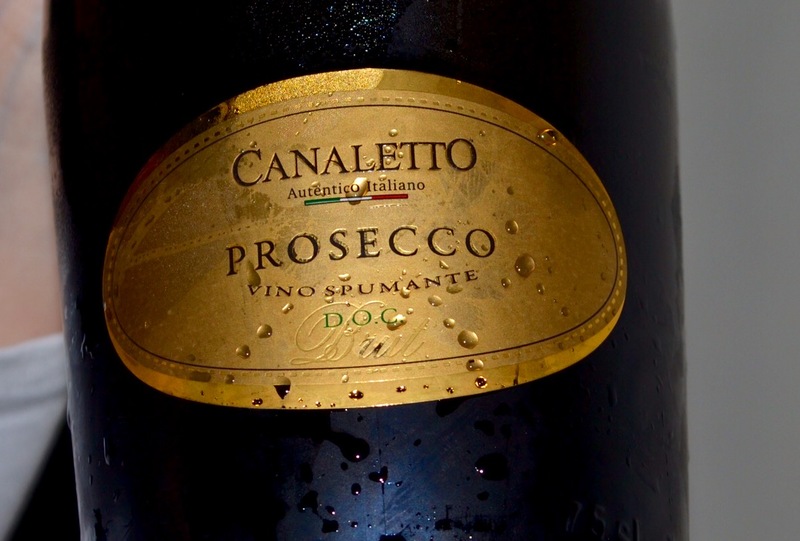 We ordered a nice bottle of Canaletto prosecco between us which was placed upon the table in an ice bucket. I don’t think I even looked at the mains on the menu because Catia had already told me that lamb shank was on the specials board and she was having that, so I just ordered the same. Loretta went for the salmon. The specials board had a number of dishes such as aubergine lasagna, a chicken dish, fish and one or two others, all of which sounded really nice. The waitresses who took our order were also very nice and friendly. We decided to share between the three of us a starter which was fishcakes (although there was only one, but it was fairly large) with a chilli sauce dip. Helpfully we were each given a plate and cutlery. 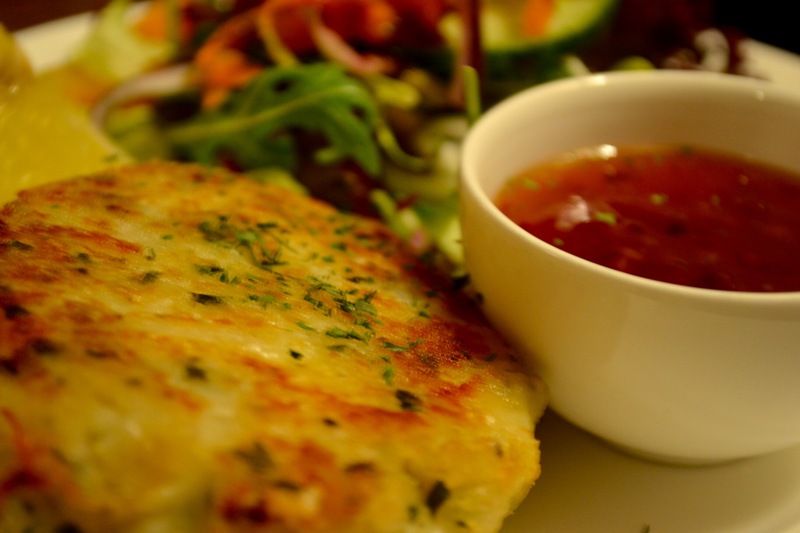 The sauce certainly had a kick to it and the fish cake I could taste smoked haddock – not something I’m terribly keen on normally but it was very tasty. Perhaps I should try it more often in the future. 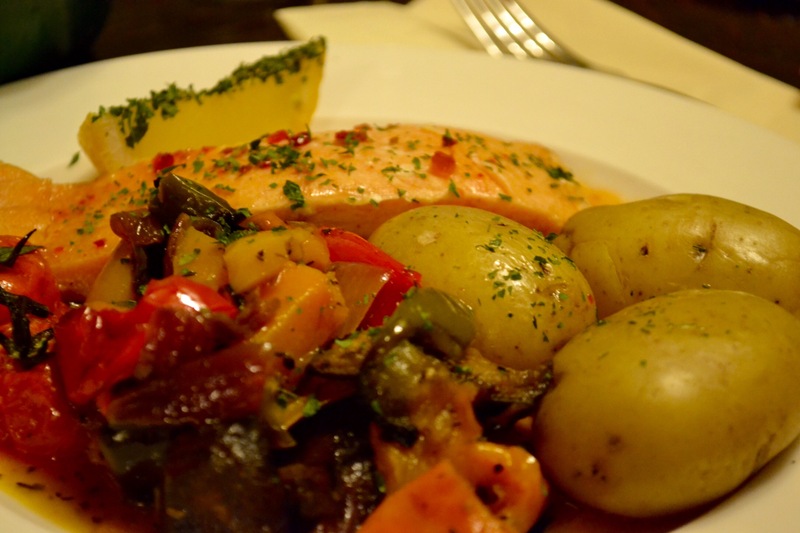 Loretta had a nice salmon fillet with boiled potatoes and Mediterranean vegetables. 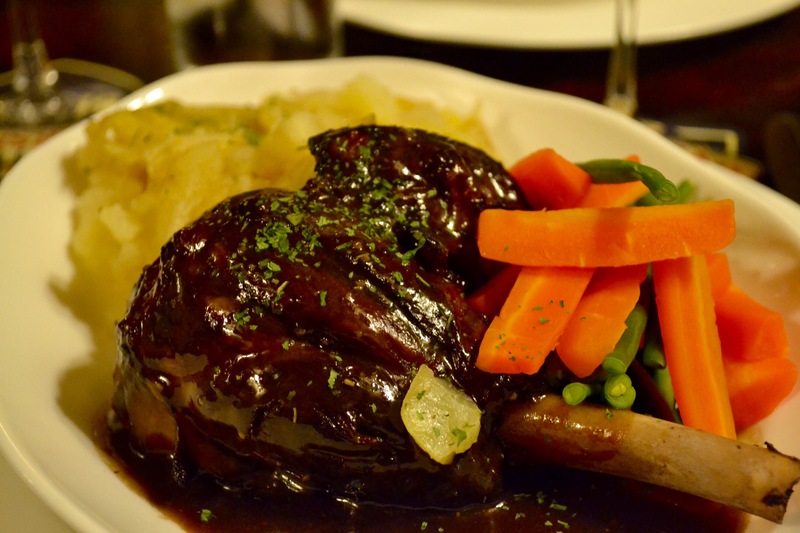 The lamb dish was a roasted lamb shank which had tons of juicy tender meat on it. This was served with green ‘squeaky’ French beans, carrots, potatoes which were quite ‘black peppery’ and a nice rich gravy. Of course we had to have a dessert each, no sharing on this dish! 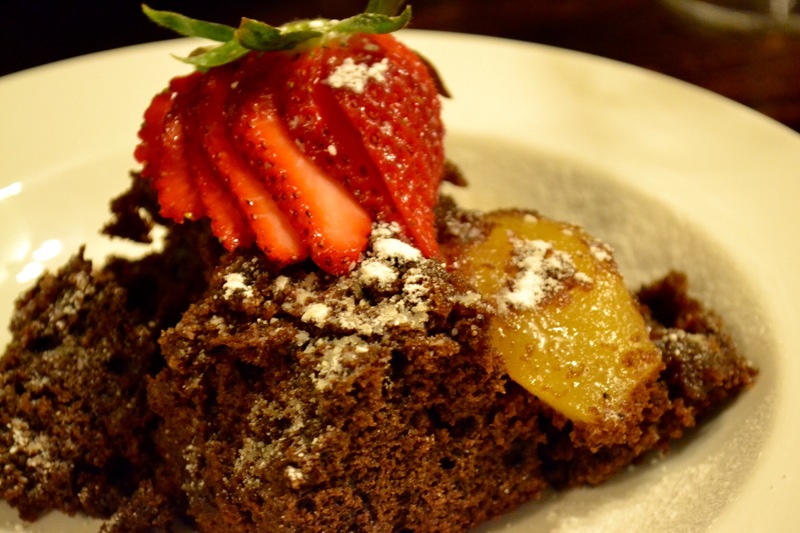 I liked ALL of the dessert dishes. 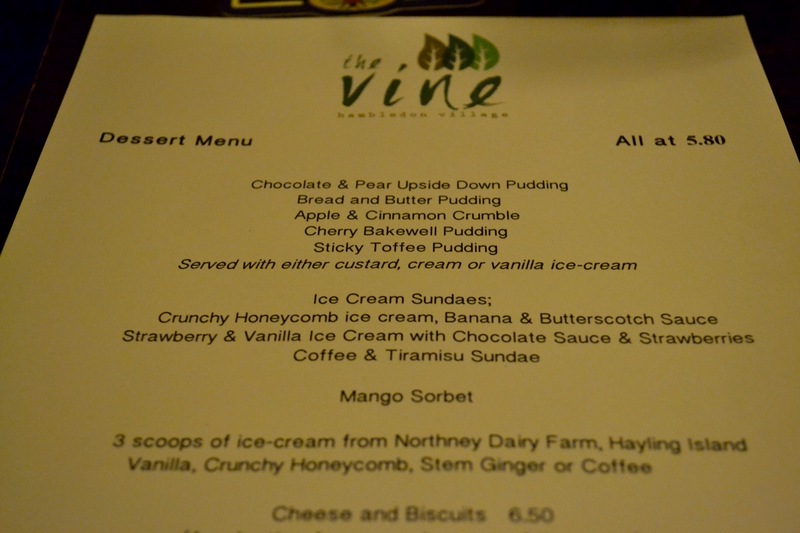 The dessert menu, but which to choose…? 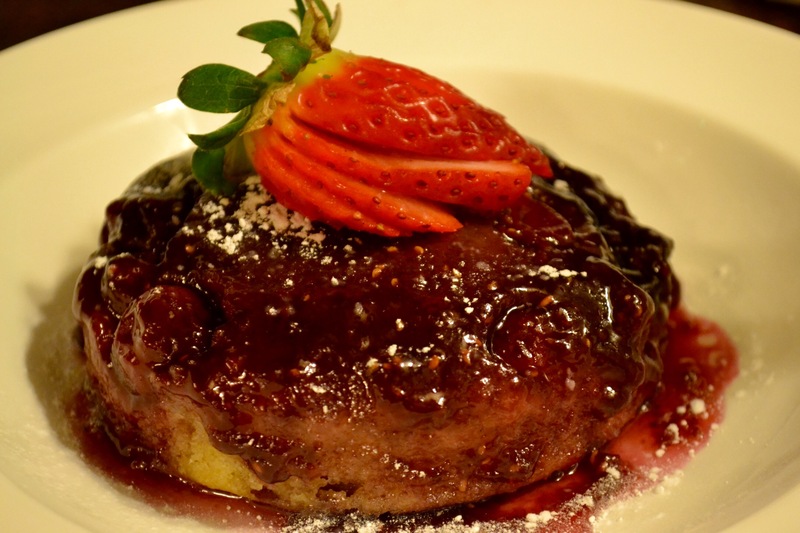 I eventually came to a decision and went for the pear & chocolate upside pudding with cream. This was definitely home made and was very fresh, light and chocolatey. Only one chunk of pear but it was juicy and nicely cooked. Catia went for the Bakewell tart which was quite strongly flavoured with almond. I had a little taste and she of mine and although she enjoyed her tart, she preferred mine. 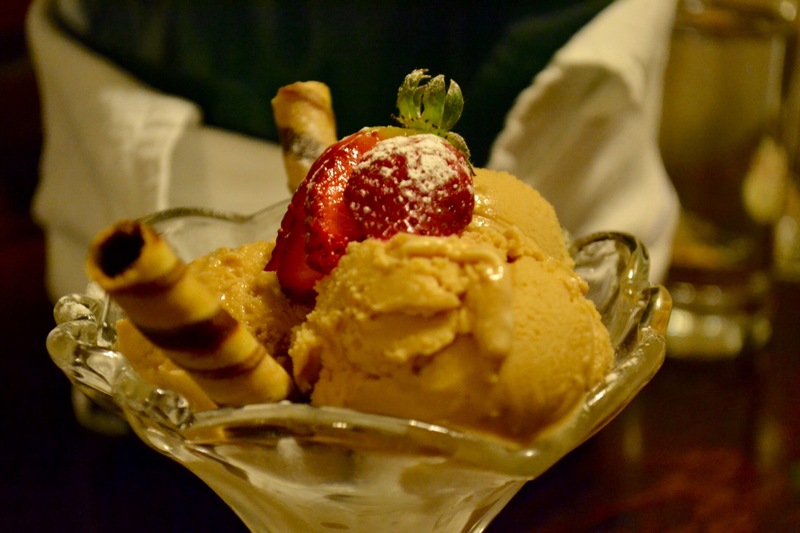 Loretta went for Crunchy Honeycomb ice cream which comes from Northney Dairy Farm on Hayling Island, which isn’t too far away. We each had a little bit of this and it certainly was delicious ice cream. We finished off the evening with an espresso. Throughout our meal it seemed that almost every time someone opened the pub door the fire would belch out smoke which was quite funny, it got us laughing and was a talking point with the other people on the tables close to us, including the people on the table near the fire, which I was rather glad we hadn’t sat at after all. The people on the table near the large bay window opened it up a little to let some smoke out, although thankfully not for long as it was quite a chilly February evening. We went home stinking of smoke but it was rather funny and we enjoyed the evening. Loretta couldn’t find her bag and I my scarf. We looked behind the padded seat and there they both were, nicely squashed. (7 is not a bad score, it’s average/what you would expect).